Don’t let funerals bury you financially! Consumer advocates warn that folks should not allow themselves to be taken in by funeral directors who are profiteers. Facing the death of a loved one is heartbreaking, to say the least. What compounds the grieving period, even more, is having to plan a funeral while you’re in the throes of trying to cope with your loss. Funeral costs are exorbitant, and according to the National Funeral Directors Association, can exceed $10,000. Some funeral directors might use a guilt trip tactic that will make family members dig deeper into their pockets to pay for a funeral with bells and whistles they cannot afford. They might try to say you don’t want to skimp because funerals aren’t just about the deceased. They might also throw in that the ritual involved in burying a loved one provides support and healing to the family. Shop around for the best funeral cost pricing. Unfortunately, many of these funeral directors will make you feel as if you are buying a car and so you have to view and handle them as you would this type of salesperson. Shopping price quotes from various funeral homes can save you thousands of dollars. You will need to get price quotes for each service provided such as the transport and care of the body and arrangement options (wake versus quick burial or cremation). Get your pricing in writing so that you can sit down later to compare. Funeral directors are required to give you a written, itemized price list for their products and services, according to the “Funeral Rule” enforced by the Federal Trade Commission. Don’t pay for services that are not necessary! You can provide your own makeup and hairstylist/barber to work on the deceased which can save you quite a bit. 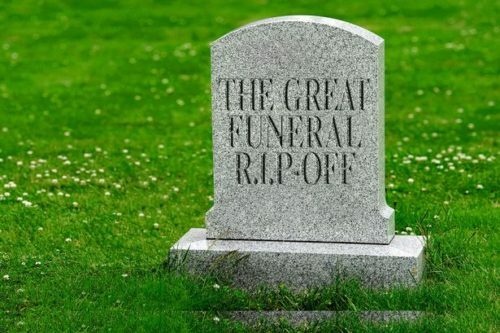 A funeral director might also try to push embalming services which according to the FTC, no state routinely requires it unless the body is not buried or cremated within a certain time. If the arrangements will be delayed, ask about refrigeration to preserve the body. Cemetery admins will oftentimes push casket vaults. There are a few unscrupulous cemetery operators who have been known to imply – or in some cases, outright lie – that the law requires customers to buy burial vaults for their grave. There is no law that mandates burial vaults. In regions in which cemeteries require that burial vaults be installed in all graves, this is typically in wet areas, particularly along coastlines and large rivers. In these situations, consumer advocates typically have no choice but to advise that those who are planning the burial of their loved one, go along with local regulations and customs. Where there is a choice, however, consumer advocates are often apt to recommend that you do not, in fact, need a burial vault. If you are required by your cemetery to install a burial vault for your loved one, you should almost always opt for the least expensive, and most basic vault that you can order. Cremation. With the average cost of a funeral in the double-digit thousands range, cremation can wind up topping off at around $3,200. You can shop an urn at several places online with some costing as low as $30. The federal Funeral Rule states that funeral directors can’t require a casket for cremation. They must offer other choices, including a simple cardboard box. The Federal Trade Commission says a funeral home may not refuse to use an urn that you purchased elsewhere. Caskets can be shopped. Don’t let a funeral director bully you into buying one of their expensive caskets when you can purchase one from a retailer. Beware of the sales pitch for a sealed casket to help keep out “gravesite elements” — meaning water and bugs. That seal is often just a cheap rubber gasket and can add hundreds of dollars to the casket cost. A friend purchased a stunning mahogany casket for his mother at Costco for $1,800. A funeral director featured the very same casket for a whopping $5,900. A funeral home must accept a casket that you bought on the Web or at a local store and they cannot charge you extra to handle it. Sure, a funeral director may try to change your mind by sweetening a deal with a “discounted package price” on the entire funeral if you include one of their caskets — but this really isn’t a discount. They might even offer reduced casket prices but have the difference rolled into their basic services. Go green? Instead of embalming which uses toxic chemicals and steel caskets that are not biodegradable, some folks have opted to go the green route, shrouding. A body is wrapped in a sheet that can cost around $40 and then buried. If someone prefers that the body be placed in a coffin-like container, they can opt for a biodegradable wool one that can cost around $350. Natural burial grounds accept shrouded bodies, and there are 22 in all in this country. Direct Burial/Cremation. Eliminate the formal services, costly hourly viewing/visitation time, programs, memorial cards, and go the direct burial or direct cremation route. You can celebrate your loved one’s life afterward at a home, community center, gallery, church, or even park. Try printing memorial cards yourself, decorating your chosen space with your loved one’s favorite items and share heartfelt memories. If you need more information on funeral home price comparison shopping, here are a couple of free sites that can offer some guidance–Parting.com, compares pricing and FuneralDecisions.com provides estimates from local funeral homes.